A deadly sin – in the flesh! 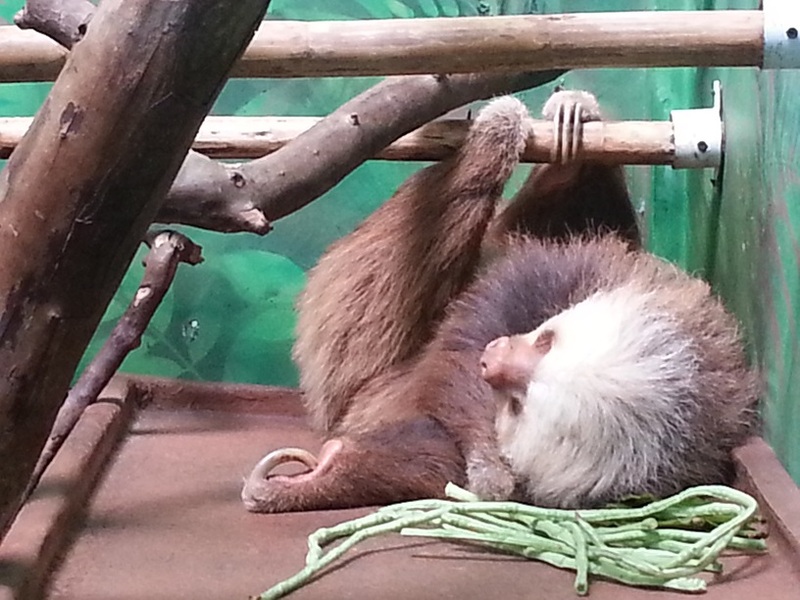 Today I saw a sloth for the first time… both in a sanctuary, and in the wild! I also saw my first Costa Rican monkey.. so it was a very animal-y sort of day. The sloth sanctuary exceeded my expectations, and included getting up close and personal with a few ‘rescue’ sloths, seeing the sloth babies in the nursery and then going on a little canoe trip through some tropical jungle. I also learned that both two-toed and three-toed sloths have three toes, it’s just that the two-toed ones have two fingers and the three-toed ones have three fingers. Or something like that.. it was very confusing and somewhat counterintuitive. We ended up spending a few hours at the sloth sanctuary, and spent the afternoon eating lunch and just relaxing… plus a late afternoon yoga class for me. When I got back to the hotel after yoga, Adrian was looking somewhat stressed. Apparently, the hotel owner’s wife had just driven back from Panama (or destination for tomorrow) and was the last car through before locals blockaded the road in protest over something or other. Last time, the road stayed blocked for upwards of two weeks. Then again, sometimes it’s just for a couple of hours. The owner’s wife had taken a few photos of tree branches across the road, and said that the locals weren’t letting anyone in or out – including a lady in labour. Somewhat suboptimal, given that was the road we wanted to be on in less than 24 hours!! This entry was posted in Costa Rica and tagged protest. Bookmark the permalink. ← On the Caribbean coast now! Fingers crossed that you make it!